The world's biggest trees are experiencing a growth spurt. 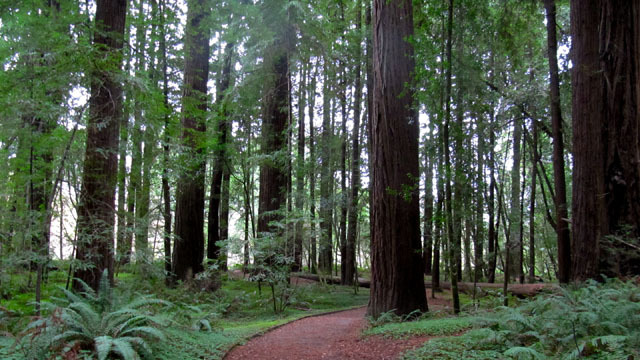 Coast redwoods and giant sequoias have grown faster in the past few decades than they have in a millennium. Scientists think climate change is at play, causing longer growing seasons in the Sierra Nevada, which benefit the sequoias, and less fog on the coast, which means more sun for the redwoods. The fastest-growing tree the researchers found is putting on 1.6 cubic meters of wood a year. "That's the equivalent of this tree making 3.2 million pencils every year for the last decade. Which, over a decade, is enough to give everyone in California a pencil. And that's one tree," explained Emily Burns, the director of science at Save the Redwoods League, which leads the Redwoods and Climate Change Initiative (RCCI), a research project that also includes scientists from University of California, Berkeley and Humboldt State University. California's iconic coast redwoods and giant sequoias live only along the Northern California coast and in the Sierra, respectively. With such a limited range, scientists wondered, how would old-growth forests handle change? Four years into the research, the answer seems to be, they're loving it, which is hardly what the scientists expected to find. For years, scientists have been warning of the toll that climate change was likely to take on coast redwoods, partly because of reduced fog, which provides them with water. "I think when we hear about climate change, and especially warming, I equate warming with dry. We know that is hard on the trees and other plants," said Burns. "What we are realizing is that when the redwoods have enough access to water, even if it does warm up, under the current amount of warming, it's a great condition for redwoods. That's a wonderful happy surprise for us." "One of the things that makes research so wonderful to do is surprises," added William Libby, a professor of forestry and genetics at Berkeley and an adviser to the project. "If we just found what we thought we were going to find, that would be pretty dull work." Though one might add, climbing to the tops of some of the tallest trees on Earth for work (see video) could hardly be construed as dull, no matter the outcome. 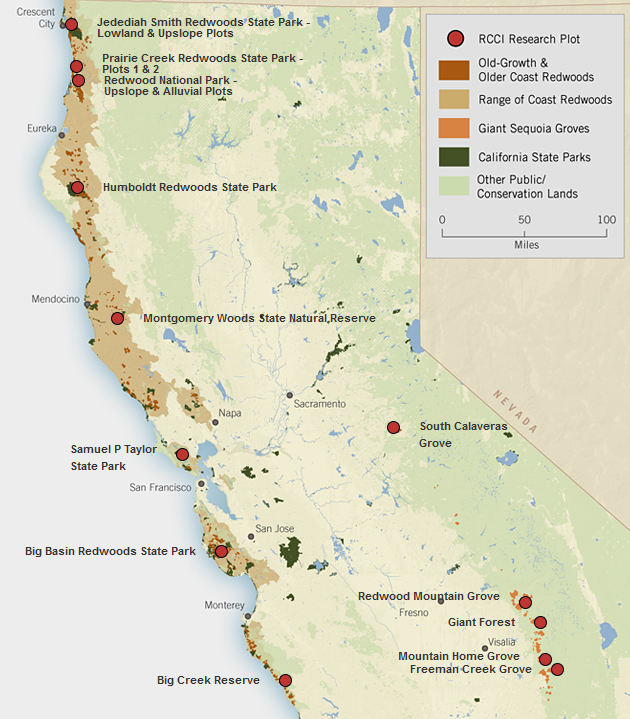 The Redwoods and Climate Change Initiative is looking at trees in 16 plots of old-growth forest in California, and has created a coast redwood tree ring record dating back to the year 328 (no, that's not missing a 1 in front). What can you learn from such an old record? Well, the year 1580 was a rough one for redwoods. "They didn't grow very much," said Burns. "And that was a year that Sir Francis Drake reported having ice on his sails as he sailed along the coast of California. So we're beginning to tease apart what conditions lead to tremendous growing conditions for redwoods and which ones are more detrimental." In addition to figuring out just how big these trees are and how fast they're growing, other members of the team are studying how seedlings respond to drought, how the climate where the trees live will continue to change and how redwoods have weathered previous climate changes. "What we're really wondering is, how long can (the growth surge) be sustained?" said Todd Dawson of UC Berkeley, another member of the RCCI team. He studies how the climate has changed in the past and how the trees responded then. That could help forecast what the future holds for the big trees. "As climates get warmer and potentially as snowpack declines and precipitation changes, are we going to hit some sort of a tipping point where all of a sudden new growth begins to decline and trees begin to decline?" he wonders. There are other questions still out there. The trees that are growing like gangbusters are the big ones, but the scientists hope to look at younger forests, too, and at the edges of forests, where these trees come into competition with other species. Burns said, the team will continue to monitor the trees for the next ten years to establish a baseline and look for change over time. Though with such long-lived species, Libby said, they should think in longer increments. "One hundred years, minimum," he said. After all, what's a decade to something that hits a growth spurt during its second millennium of life?